This weekend I truly realized how old I am...I was 100% completely exhausted by 2:00 pm Saturday after a day and half on me feet baking. Like it was difficult to finish washing the necessary dishes on Saturday...as in I was hunched over the sink washing dishes...as in Sunday I took a two hour nap when we got home. 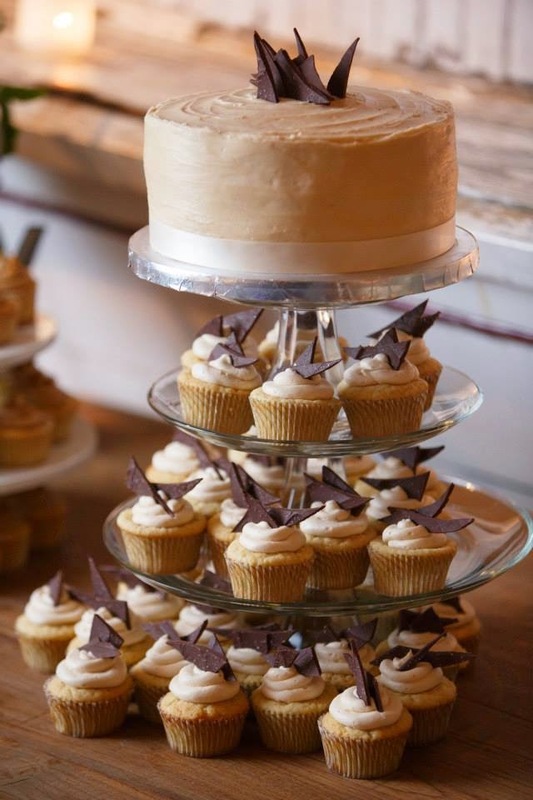 But I had to rally on Saturday, finish washing the dishes, get cleaned up myself and pack up all the cupcakes, plus the cake, because (A) there was a very important wedding to go to and (B) the cake and cupcakes weren't going to deliver themselves. Don't get me wrong it was totally worth it, but I do think I want one of those fancy padded kitchen mats now. The cupcakes for the wedding were chosen by the bride...salted caramel (her favorite and the flavor of the cake), champagne raspberry and "Biscoff" cookie. I have made each of these cupcakes in either cupcake or cake form before but I had to blog about it because the cake came out so freaking delicious...like the bride and groom ate the entire piece they cut. We served the rest of the cake because who really wants year old frozen cake, and I had to try a piece myself. Take three layers of vanilla cake with salted caramel and caramel drizzle into between each layer and what more can you ask for? I almost didn't have a piece because even after showering I still felt like I was covered in sugar, but boy am I glad I did. I will be making this one again! Its starting...it's that time in our lives where between Charles and I...alot of our friends are getting married or engaged. We were in Philly last weekend, head to Annapolis this coming weekend...oh and the weekend after that we head to Hampton, VA. To say the very least it is super fun and exciting time! Plus, it gives us an excuse to travel, and for trips where we only have to be away for a night or two. That is until the wedding in Charleston at the end of June...but I am always looking for any sort of excuse where I have to go to Charleston. This past weekend was truly a blast though and was so great to see friends that we don't get to see often enough. It also made me feel like we are all really starting to grow up, friends are getting married, and some even have kids already! Philadelphia's Magic Gardens...one of my favorite spots in Philly. CAKE! Oh how I love checking out wedding cakes.